We are excited to add Papillon Gin to our vineyard shelves, made close to home in the heart of Dartmoor! Papillon Gin is the first of its kind, made within the Dartmoor National Park. Created by Adam and Claire in Moretonhampstead, just 20 miles from us at Alder. Having both grown up on Dartmoor, they decided their gin had to celebrate all that Dartmoor has to offer. The character of their Gin is built upon fresh Dartmoor spring water and native botanicals. These include flora such as gorse flowers and Devon violets. These unique ingredients are hand grown or foraged locally, which married with the traditional gin botanicals give a rich character. 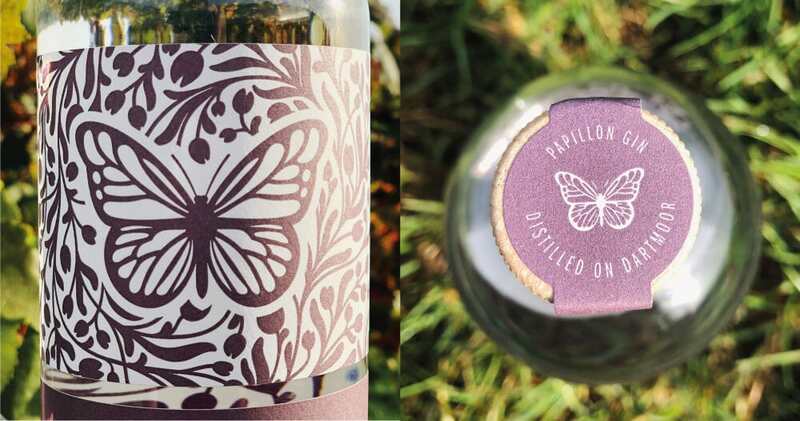 Papillon Gin gains its identity from the Pearl Bordered Fritillary, an endangered Dartmoor butterfly that feeds on wild violets. These violet are one of the key botanicals that make the gin so unique and flavoursome. To aid their protection, 1% of each bottle is donated to The Butterfly Conservation Project, protecting fritillaries across Dartmoor. Don’t just take our word for it! To get a bottle for yourself, visit us in the vineyard shop where you will also find a range of other local delights.